Have you been diagnosed with or believe you have cubital tunnel syndrome, ulnar nerve compression or entrapment or ulnar neuropathy? Are you looking for more information on these health conditions, their symptoms, or your treatment options? 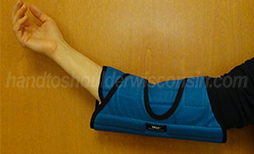 The team at Hand to Shoulder Center of Wisconsin has experience treating cubital tunnel syndrome and has put together the following information to help you learn more. Contact the Hand to Shoulder Center of Wisconsin in Appleton or Green Bay for more information! Cubital Tunnel Syndrome – What is it? Cubital tunnel syndrome is a painful irritation of the ulnar nerve on the inside of the elbow. The ulnar nerve travels the length of the arm, beginning at a bundle of nerves near the shoulder called the brachial plexus, extending towards the hand, and ending in the pinky and ring finger. Nerves are cord-like structures that deliver signals between the nervous system and other organs supplying the body with sense of stimuli such as temperature, pressure, and pain. The ulnar nerve travels down the arm and passes through a bony canal (cubital tunnel) in the elbow. It continues into the wrist and palm region, where the nerve separates, giving sensation to the pinky side of the palm and half of the ring finger. Ulnar nerve entrapment is a fairly common condition that occurs when the ulnar nerve is compressed, pinched, or irritated. This can occur in the wrist, beneath the collar bone, or as it comes out of the spinal cord in the neck; it is most commonly experienced in the elbow. The ulnar nerve must travel through a narrow pathway in the elbow region with very little soft tissue protection making it vulnerable to compression. Ulnar nerve compression located at the elbow region is referred to as cubital tunnel syndrome. What are the symptoms related to Cubital Tunnel Syndrome? Depending on the area of compression, the most common symptoms are numbness and pain in the hand, wrist, or fingers. Pain and aching on the inside of the elbow can be an additional sign however most of the symptoms do occur in the hand. Numbness or falling asleep sensations in the ring and little finger that come and go are common symptoms. Weakness and tenderness in the hand and/or elbow and sensitivity to cold may occur. Bending the elbow for prolonged periods or activities that require the elbow to be used repetitively may increase symptoms. In severe cases, weakness in gripping and difficulty in finger coordination may occur. What testing can be done for Cubital Tunnel Syndrome? A thorough medical examination is conducted by a qualified hand and upper extremity medical physician. Upon evaluation, the physician will explore prior hand, wrist, and arm injuries and medical conditions. The physical examination will assist in determining which nerve is compressed and where the compression is occurring. X-rays may be ordered to determine if arthritis, bone spurs, or present/previous fracture conditions are causing compression on the ulnar nerve. Nerve conduction testing may also be ordered. Nerve conduction testing allows electrodes to be taped to your arm to measure how well the nerve is working and identify the location of the compression. In most cases with mild symptoms, non-surgical treatment options are recommended. Mild symptoms may gently subside by modification of daily activities (Svernlov, 2009). Bracing and splinting may be applied to prevent full elbow flexion (Fig. 1). Non-steroidal anti-inflammatory medicines and nerve gliding exercises may stimulate improvement of the symptoms. Arm exercises may ease stiffness in the wrist and elbow. If conservation actions fail, a surgical procedure may be recommended. Surgery for ulnar nerve entrapment is usually preformed as an outpatient procedure. The surgery is commonly known as ulnar nerve decompression and is performed at Woodland Surgery Center or one of the three Fox Valley hospital locations. An incision is made on the inner elbow region and the ligament of the cubital tunnel is released (cut) and divided. Pressure on the ulnar nerve is relieved (Caliandro, 2012). In severe cases or in cases of nerve instability, an ulnar nerve transposition can be performed. This involves the surgeon re-routing the ulnar nerve from the back side of the elbow to the front. Following the surgery, our physician may recommend hand therapy to help regain muscle strength and mobility. Patients can expect soreness or discomfort at the incision site for several weeks and up to several months for severe cases. Svernlov B. Larsson M. Rehn K, et al. Conservative treatment of the cubital tunnel syndrome. J Hand Surg IEur). 2009; 34(2): 201-207. Caliandro P. La Torre G. Padua R, et al. Treatment for ulnar neuropath at the elbow (review). 2012: The Cochrane Collaboration.